Enakkum romba pudikkum..... How are the exam preparations? U have nice and lovely blog.I also love bajji very much.Thanks for visiting my blog. 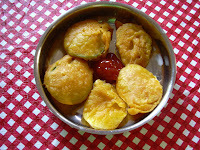 This is my first visit to your blog,you have a nice one,Bajji is one of my favorites ! Thanks Sireesha, I visited yours too. You really have a wonderful blog too. Thanks Usha, for the visit and for the comment.